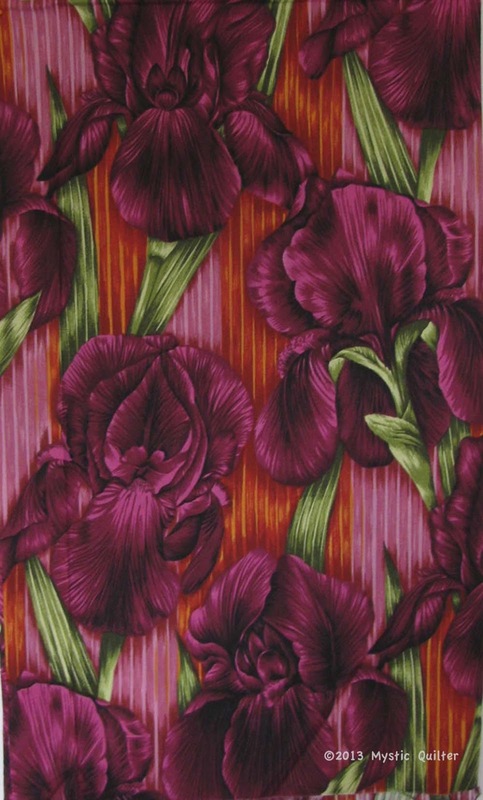 At last I found the backing fabric for New York Blooms tucked away in one of my baskets. 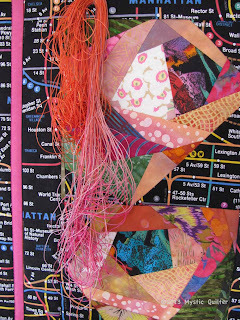 I had this in mind after putting the final subway fabric border around but couldn't remember where I had stored it. The machine quilting in the ditch around the four blocks has been done, also in the ditch either side of the narrow pink border. I really don't want to put any quilting in the subway border I think it would spoil the effect of the coloured tracks meandering across the black background, so I'm going to pass on that. My hand has settled down a little now so I picked out some of my thread and intend to go ahead with hand quilting within the blooms. Another two weeks and this should be finished, hopefully it can go into my exhibition February next. Fabulous choice for the background! Beautiful backing fabric, and I can't wait to see the hand quilting you do! luv those irises! I will be waiting to see the big finish! Your thread colors are luscious. Are they Perle cotton? Willa, The Reader and roccogal - I fell for the iris fabric when I first saw it on the shelf of the shop a few years ago! Thought I would only use a small amount so only bought a yard - now wish I had bought something like three!! Helen - can't remember the make-up of the thread, not perle cotton I do know that, it's terribly fine and I'm thinking rayon and something else, very silky finish to it.